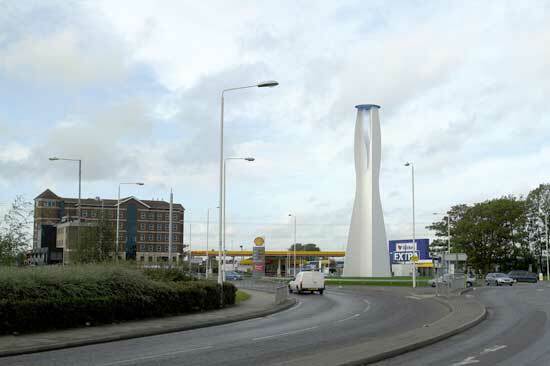 A 20 meters high landmark sculpture is situated at the roundabout, the entrance from the northern road to Barking. It forms a gateway into the town from the A406. The Lady day and night. At night lamps of different colours illuminate the Lighted Lady, lending it a festive appearance. Driving around the Lady. The silhouette changes as one moves around it. 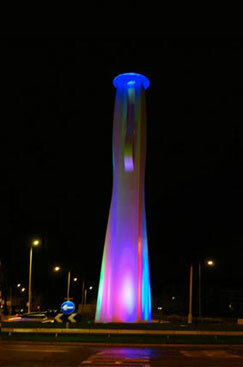 The Lighted Lady on the roundabout at the entrance from the northern road to Barking. Top of the sculpture with daylight reflections. A blue acrylic disc at the top creates an ethereal ellipse against the sky. Top of the sculpture with LED lights at night. 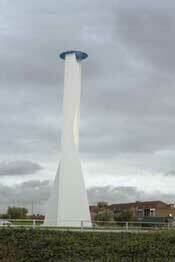 Description: The Lighted Lady is situated at the roundabout, the entrance from the northern relief road to Barking. 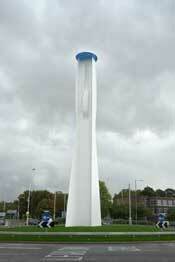 At 20 metres high, it forms a gateway into the town from the A406. 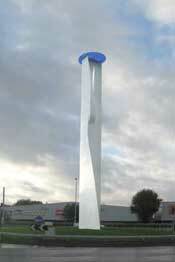 The sculpture is constructed from steel with a white coating. The silhouette changes as you move around it. At blue acrylic disc at the top creates an ethereal ellipse against the sky. At night lamps of different colours, which are placed around the sculpture, light the Lighted Lady lending a festive appearance. This striking, colourful sculpture was designed by Dutch artist Joost Van Santen's company "Light Art". 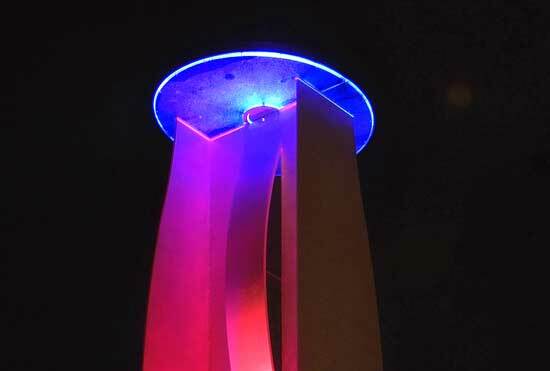 It was unveiled in 2006 and is known as the "Lighted Lady of Barking Town." Joost Van Santen's earliest work dates from 1970 and can mainly be found in Amsterdam, the Hague and many smaller towns throughout the Netherlands. His 3 most recent commissions however have all been in England. We are lucky enough to have two of them here in Barking Town ... the "Lighted Lady" and another piece called "London Bridge" - see my separate tip. The very best time to see the sculpture is at night when it is lit by lamps of many different colours, sited around the base. This gives it a very striking festive appearance. The blue top is lit with LED's. The "Lighted Lady" is one of those controversial, love-it-or-hate-it sculptures - One thing is for sure, you certainly cannot ignore it. You can find it in the middle of a roundabout on the outskirts of Barking Town. I have given as many details as I can about the sculpture here as unfortunately, there is no plaque anywhere near the "Lighted Lady" giving additional information.